Scooter's World: I did it. 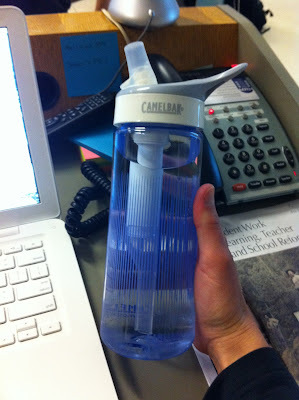 Oh, and another thing I want to share with you all reusable resources people: my buddy Lauren told me about the new Camelback water bottle that just came out that has a filter! In the words of my 7th graders, OMG! This is so awesome! First off, I'm addicted to my Camelback water bottle...I have a zillion of them. And now they come with a filter too?! Even better! So I had to dash off to Target last night and pick one up. LOVE IT! It was reasonably priced at $24.99, and is a super cute blue and white. Anyways, check it out! I love having a portable filter-water station on-the-go! Hooray!